I began riding in 1972 on a Yamaha 350 street bike. After an extensive time period without motorcycles while overseas in the Air Force (13 of my 25 year career) we now ride an HD Ultra Classic Electra Glide. Dianne and I bought it new in 2008 from Adamec HD in Jacksonville, FL. Riding the backcountry canopy roads of South Georgia and North Florida is a great stress reliever after coming home from my 10-12 day flight schedules. I’m blessed to live where I can ride year round. I have three Bad to the Bone LDR designations, all Easy Rider 500/12 awards: The first was a solo ride from Tallahassee to Louisville, KY to go work. Louisville is my home base for UPS. The second was accompanying our younger son on his 2008 Street Bob from his home in Palmdale, CA to Napa Valley. Once there, we all had a great weekend in the wine country! My third award was for another solo run, this time from Tallahassee to Roanoke Rapids, NC on my way to visit our oldest son and his family in Hartford, CT. 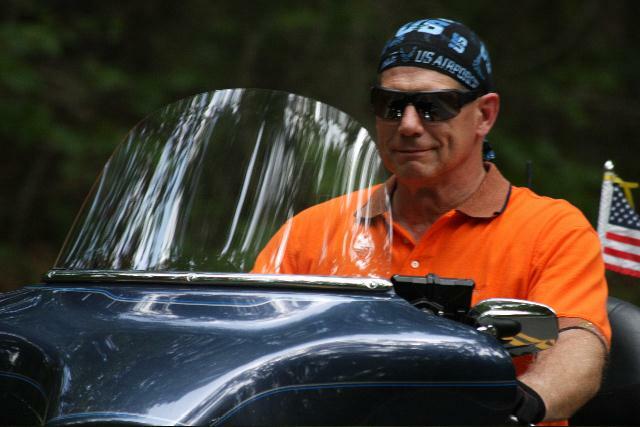 I also rode to Washington D.C. for the Ride to the Wall over Memorial Day weekend 2010, although, it wasn’t an LDR ride. I have ridden to both Sturgis and Daytona for their rallies, as well as all over Colorado. There is absolutely nothing better than the Harley “potato-potato” sound echoing through the Rockies! My next LDR goal is the King of the Road award, 1500 miles in 36 hours. That seems easier than the Full Throttle 1000/24 ride since you have time to get a serious rest stop of about eight hours in the middle of the 36 hour time limit. Also on my “bucket list” are the Born to be Wild coast-to-coast award and a non LDR group ride to Alaska. I fly to Anchorage, AK once or twice a month for UPS and I see how beautiful the ALCAN is from the air. It’s time to see it up close on two wheels. Perhaps my 39-year history of flying airplanes instilled in me the value of good, proper planning. As a result, I enjoy the planning phase of long distance riding almost as much as the ride itself. Investigating routes and stop points, and alternative options, goes a long way to building confidence that the ride will go safely as planned. I’ve also learned you need two things to successfully achieve long distances on a motorcycle, comfort and understanding. By that I mean a comfortable bike and an understanding spouse. I am a member of National H.O.G., Tallahassee H.O.G., and the American Motorcycle Association, in addition to LDR. If you see us out on the road, stop and say hello. We’ll be on the air force blue Electra Glide with a Florida plate “3LOVES,” which stands for, strangely enough, my 3 loves: 1) Dianne and our family, 2) the F-15 Eagle, and 3) the HD Ultra Classic that we ride. I encourage you to Live Free, Ride Free!